The exponential growth of the on-demand platform economy has fuelled a commercial revolution across industries such as transport, accommodation, retail and the fast-food sector. The ‘Uberisation’ effect has forever altered consumer consumption trends and is driving business growth through increased sales. The resultant rise in economic activity has also created many new employment opportunities. In this regard, fast-food delivery services have experienced prolific growth. The convenience of ordering meals for delivery via a smartphone app forced the sector to scale rapidly to meet the resultant demand. 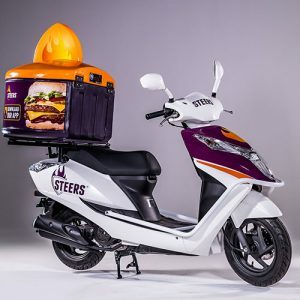 “Fast-food chains or franchise owners either own the delivery bikes used by drivers, rent bikes or they employ owner-drivers,” explains Dorrin Lewis, chief operations officer at Mobile Macs, a leading local provider of safe and reliable bike fleet solutions. These bikes cover significant mileage, and any vehicle that isn’t on the road making deliveries isn’t generating income for the store or the driver. “As a result, both stores and owner-drivers do a terrible job of keeping up with bike maintenance requirements,” says Lewis. Compounding the issue is the quality of bikes that most owner-drivers can afford. “Many are dilapidated and unroadworthy because these are the only options drivers can invest in to make a living. And due to their financial constraints, they also find it difficult to afford regular maintenance.” Or, he says, they use unreputable mechanics to work on their bikes. The bottom line is that the state of the delivery bike sector in South Africa is dismal. Most vehicles are unreliable, unhygienic and downright unsafe for the drivers and other road users. To address these issues and transform the sector, Mobile Macs has introduced a full-service delivery bike fleet solution. “The pioneer of the on-demand services economy, Uber, has strict roadworthiness and quality standards for the vehicles that leverage the platform and we believe a similar form of quality control should be introduced to the delivery bike industry to improve driver safety and the service provided to customers,” continues Lewis. Mobile Macs’ delivery bike rental system allows a driver to rent a bike from as little as R550 per week and the company provides all servicing and maintenance requirements as part of the cost. Due to our tracking system we are able to monitor mileage and notify the driver when they need to bring the bike in, we require the bike every one to two months. We service and check the roadworthiness of the vehicle, performing maintenance or repairs where required and replace worn parts such as tyres or brake pads before releasing the bike back into the rental pool,” elaborates Lewis. Mobile Macs also monitors the general cleanliness of the vehicles and ensures they have high visibility on the roads. The service provider also offers a vehicle branding service to ensure bikes align with the client’s brand, while also creating additional brand exposure and marketing opportunities. All rental bikes have vehicle tracking units fitted, which enables Mobile Macs to easily locate drivers and collect the bike if they experience a breakdown or accident. 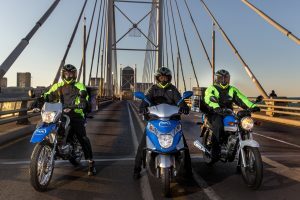 The company will also provide a replacement bike to drivers within 24-48 hours to reduce downtime and the subsequent loss in earning potential. “Due to the economies of scale we have created within our business, our convenient, proficient and reliable bike rental service offers drivers safety and reliability at an affordable weekly cost, which we believe will help to transform a sector that is in desperate need of change,” concludes Lewis. Interested drivers and businesses can visit www.mobilemacs.co.za or call 0860 111 836.